2014 Fiorini, Lambrusco Grasparossa “Becco Rosso” Emilia-Romagna, Red Sparkling Wine, Italy. 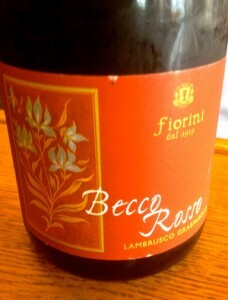 The Florin Becco Rosso is a clear and most dry red Lambrusco done in the Charmat method and is a blend of at least 80% Lambrusco Grasparossa with the rest being Lancellotta, it is a real easy to love style with good detail and character, not too rustic and with a solid fruity core with a soft mousse. I really liked the latest Florin Becco Rosso and highly recommend it to those unfamiliar with Lambrusco and those that want a crowd pleasing sparkling red to go with summer BBQ and picnics, this is certainly classy and fun stuff from the hills at the base of the Appennine Mountains near Modena in Emilia-Romagna. The Becco Rosso has a creamy bubbles a good dark garnet hue and starts with dark floral tones, a hint of raw meat and crushed blackberries along with dried anise, pepper, mineral and earthy/stony elements as well as subtle cherry cola, tangy currants and plum notes. Lambrusco is a historic and traditional food wine, it pairs with every dish from Antipasto to grilled meats and pasta, as well as cheeses and cold cuts, this delight medium bodied version from Fiorini really checks off all the boxes and makes for a great Summer and Fall wine, served chilled and refreshing, while full enough and brawny enough to make even the manly group happy. Forza Lambrusco! Drink this zesty and well made example over the next year and without quilt, it is a steal at the price and a hell of a lot of fun, Ciao!